Steel columns are used for many types of construction and are designed to provide structural support. Like universal beams, they have an I or H shape, depending on the way you look at them. 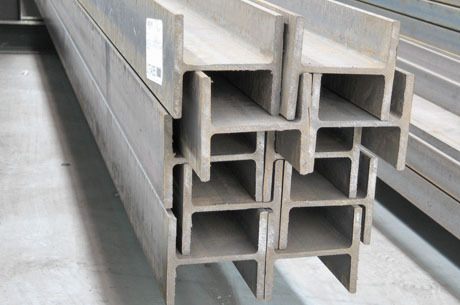 However, universal beams generally have a deeper web than that found in universal steel columns. While both universal beams and universal columns are manufactured from three main pieces – two horizontal flanges and a vertical web – they are different products, each of which has a different use. In general terms, beams carry horizontal loads while columns carry vertical loads. Also, while beams are loaded in tension, columns are loaded in compression. Because, by definition, steel columns support or carry compressive loads, the column is positioned vertically and the weight it supports (a universal beam, for example) is placed on top. While universal steel beams are usually a lot deeper than their width, universal steel columns are commonly square. This ensures that they will resist twisting. When you look at universal steel columns you will see that the web is often the same (or at very least very similar) in both height and width to the flanges. Also, the vertical web of steel columns is thicker than the web of beams, adding to the column’s compressive strength. Steel columns may be galvanized to make them resistant to corrosion. Universal steel columns are manufactured in accordance with AS/NZS 3679.1 Hot-rolled bars and sections. The standard covers relevant definitions, and designations, as well as chemical composition, allowable dimensions, manufacturing tolerances, freedom from defects, and a host of issues relating to testing requirements and procedures. The scope of the standard relates only to the production and supply of hot-rolled structural steel sections and bar to be used for general structural and engineering applications. The grades specified are suitable for riveting and bolting and for welding. Typical uses include engineered construction and both residential and non-residential construction. Steel columns are used in mining infrastructure as well as in the transport and storage, and manufacturing industries. BlueScope Distribution sources steel columns from reputable and reliable Australian-based manufacturers, thus ensuring that all products have consistent quality and that they adhere to strict Australian standards for Grade 300 steel. Universal columns are available in five basic sizes with a variety of section and flange depths as well as different thicknesses and radii. Light steel columns come in three designation sizes: 100 mm, 150 mm, and 200 mm. Heavy steel columns come in two sizes: 250 mm and 310 mm. The section mass of BlueScope’s steel columns ranges from 14.8 kg/m for the lightest columns to 158 kg/m for the heaviest columns. In all instances, where there is more than one option, they follow the same order. So, for instance, a 200 mm universal steel column with a section depth of 203 mm has a flange width of 203 mm, a flange thickness of 11 mm, a web thickness of 7.3 mm, and a root radius of 11.4 mm. BlueScope Distribution also offers larger welded columns that are manufactured in accordance with AS/NZS 3679.1-300. There are three designation sizes: 350 mm, 400 mm, and 500 mm. The smallest welded columns have a section mass of between 197 kg/m and 280 kg/m. Section depth ranges from 331 mm to 355 mm. The flange width is the same for all four 350 mm steel column sizes while flange thicknesses range from 28 mm to 40 mm. The depth between the flanges is 275 mm while the web thickness varies from 20 mm to 28 mm. The 400 mm welded columns are available in seven standard sizes with a section mass that ranges from 144 mm to 361 mm and a section depth of between 382 mm and 430 mm. The flange width is 400 mm, the depth between flanges is 350 mm, and the flange thickness varies from 16 mm to 40 mm. The thickness of the web ranges from 16 mm to 40 mm although it doesn’t always tally with the flange thickness. For instance, while welded steel columns with a section depth of 390 mm have a flange and web thickness of 20 mm, steel columns with a section depth of 414 mm have a flange thickness of 32 mm and a web thickness of 25 mm. Large 500 mm steel columns have a section mass that ranges from 228 mm (similar to that of some 350 mm size columns) to a hefty 440 mm. While flanges are all 500 mm wide, the section depth varies from 490 mm to 480 mm and flange thickness from 20 mm to 40 mm. The depth between flanges is either 450 mm or 400 mm and the web thickness is between 20 mm and 40 mm. BlueScope Distribution supplies steel columns nationwide. Contact us so we can help ensure you buy the best steel columns for your construction projects.